"A West End and Broadway hit in 1962 creating stars out of a young Kenneth Williams and Maggie Smith, The Private Ear and The Public Eye are by the acclaimed, multi-award winning British playwright, Sir Peter Shaffer (Amadeus, Equus, The Royal Hunt of the Sun, Lettice&Lovage and Five Finger Exercise). The first major revival in 50 years of these intimate one-act plays - both short and bitter-sweet comedies performed as a matching pair on the same night - gives us a fascinating window into the turbulent changing attitudes to love in the 60s through a brilliant combination of comedy, pathos and drama." 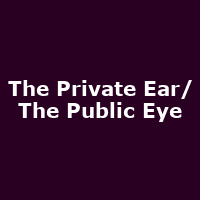 THE PUBLIC EYE takes place in a swanky London accountancy office, where uptight Charles is confronted by Julian, an eccentric private detective hired by Charles to investigate his young wife's suspected infidelity. The Private Ear and The Public Eye star Jasper Britton, one of the UK's leading classical actors, fresh from a successful run of Race at Hampstead Theatre, Marat/Sade for the RSC and The Last Cigarette at the Chichester Festival Theatre and the Trafalgar Studios London, Steven Blakeley, known as PC Geoff Younger in Heartbeat, with theatre credits including Dry Rot and Funny Peculiar, Rupert Hill, known as Jamie Baldwin from Coronation Street, with theatre credits including When Harry Met Sally and Future Me, and Siobhan O'Kelly (Inspector George Gently, Mutual Friends).